Yesterday, Bollinger were at The Ledbury in London to launch their latest vintage champagne, La Grande Année 2008. Considered one of, if not the, best vintage of the century, the recent spate of 2008 champagne releases have all been received with considerable fanfare, and Bollinger’s contribution is no exception. Produced exclusively in outstanding years, La Grande Année is no stranger to stardom, featuring in the 2006 James Bond movie, Casino Royale. Entirely fermented in oak barrel, the 2008 vintage was produced from just fourteen crus – 91% of which are Grand Cru rated, the remaining 9% Premier Cru – including Aÿ and Verzenay for the Pinot Noir, and Avize, Cramant and Oger for the Chardonnay. The 2008 vintage was a great success for Bollinger. After a rainy but mild winter without any prolonged cold spells, spring arrived with only some very localised frosts, which caused little harm to the vineyards. The spring to autumn weather was bright with sunny spells and the long, hot days and cool nights during September ensured the grapes developed excellent acidity during the harvest period. Echoing the vintage’s high regard all over the region, Bollinger consider 2008 to be one of their best ever years. La Grande Année 2008 is the first vintage to be sold in the new ‘1846 bottle’, complete with stylish new label. The curvaceous bottle design replicates the shape of a magnum, with a narrower neck and wider base, and is named after a similarly shaped bottle recently discovered in the Bollinger cellars, which dates back to 1846. The purpose is not just aesthetic either: the ‘mini-magnum’ shaped bottle slows down oxygen exchange, producing a slightly more complex wine with longer ageing potential. 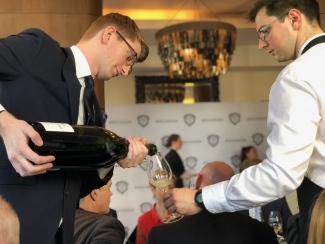 Luckily, Bollinger presented La Grande Année 2008 yesterday in all three formats – 75cl bottle, 1.5L magnum and 3L jeroboam – allowing us to assess the differing effects of bottle format even more accurately, now that they are designed as replicas. The magnum was our favourite, with its reductive, smoky character teasing both the nose and palate. The Jeroboam, although more than drinkable currently, is still so very young and underdeveloped – give this one some time, as it is packed to the brim with ageing potential. 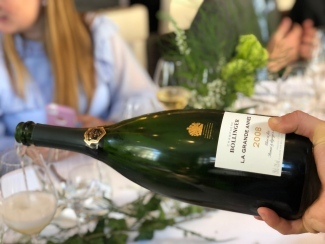 The dosage in La Grande Année 2008 is higher than normal, 8 g/l compared to the 6-7 g/l seen in previous recent releases – as Descôtes felt the freshness of the acidity in 2008 needed the balance. 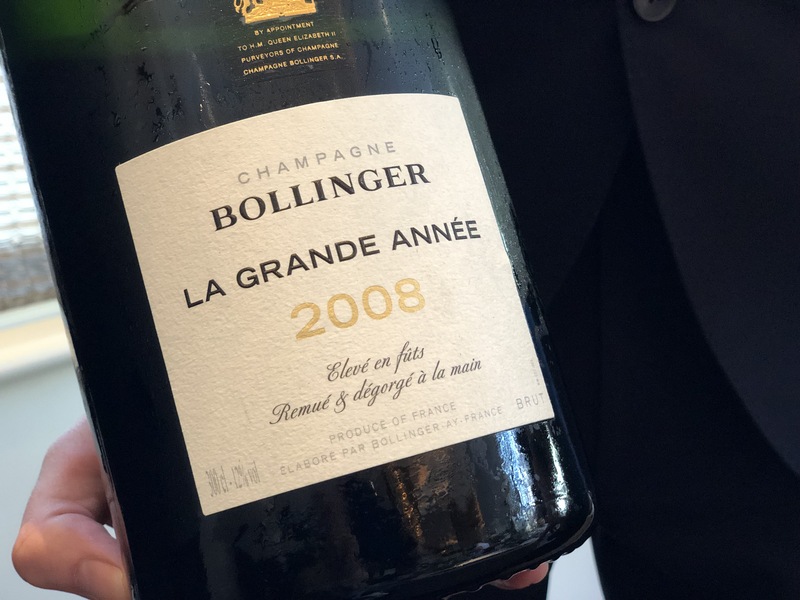 With its incredible freshness, purity and a shining fruit character that is so typical of the vintage, La Grande Année 2008 is undeniably one of Bollinger’s best vintages to date – certainly the best since La Grande Année 2002. And don’t just take our word for it – Essi Avellan MW has already scored the bottle 97/100 (the magnum and jeroboam received 98 and 99 points, respectively), commenting: “Ripe and fruity yet at the same time elegant nose with stylish restraint promising longevity. Golden delicious apples, biscuits and lemon alongside complex spicy tones. Lovely creaminess on the fresh and linear palate that finishes with a bite of mineral salinity. The tension and playfulness on the palate is its most attractive feature” – her full review can be read here. The only downside to La Grande Année 2008 is its potential shortage. Due to the financial collapse in 2008, Bollinger produced a reduced quantity of La Grande Année 2008. Compounded by the fact that the house have no doubt kept a considerable amount in the cellars to be released as Bollinger R.D. 2008 in years to come, this one may not be around as look as we would like. Bollinger La Grande Année 2008 is available to order now, for delivery early next week. The fruit comes straight out with the almond and cashew nuttiness at first and then the dried apricots. After a few minutes in the glass the fresher fruits show: kumquat orange, pineapple and apricot. On the palate all the fruit character shines, combined with the roundness the lees ageing brings and the freshness of 2008. This shows well, the higher than normal dosage in fact seems lower than normal as the freshness of the acidity needs that balance. The length is good with tangy orange character lingering. 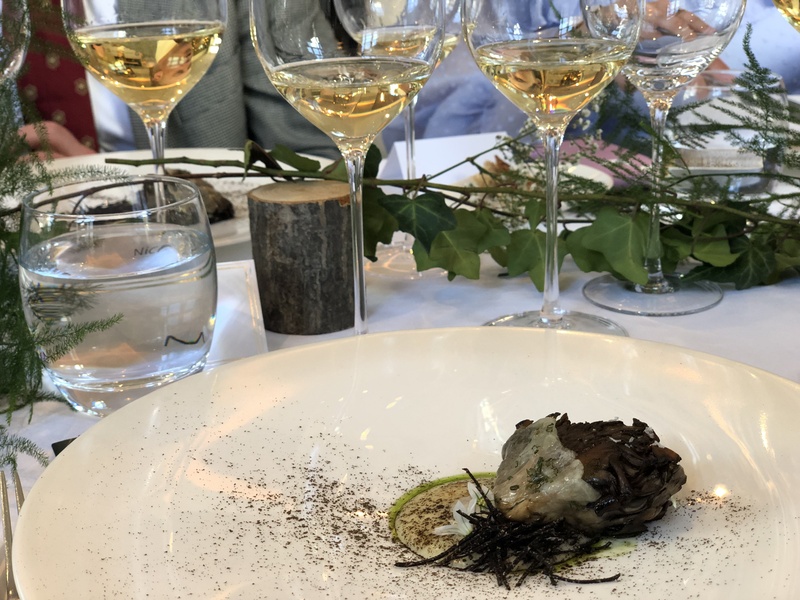 Initially you get the reductive smoky notes so common in magnums, less common in Bollinger, a lot of similar fruits though at first the fresh fruits show like pineapple, orange and lemon, and the dried fruits are much more subtle. The magnum seems to have a lower dosage, the effect of less development in the fruits makes the dosage seem even lighter and the minerality hence seems more forward. Great length and has a subtle elegance over the bottle. This is my favourite today and matches the Cornish Cod dish superbly, though that wasn’t the course it was served with! The reductive notes are more obvious, less of the smoky character more of the bread and yeasty character, a common trait with jeroboams. The fruits are noticeable, less developed at this stage so bright lemon, apples, peaches, pineapple and orange peel are all quite present. At this stage there is none of the nuttiness and the dried fruits are showing more than a hint. So the development that has already shown itself in the bottle hasn’t even started here in the Jeroboam. The acidity seems bright and the dosage again seems much lighter than the bottle. The dynamics of the larger formats is always fascinating.